Whatever the job, this insulated jacket for women keeps you warm and dry from start to finish. Made of heavy duty, cotton-blend stretch duck that sheds water, the jacket features stretch panels on the back and at the elbows so you can chop wood, turn compost, or reset fences with ease. Wash and dry inside out. Machine wash cold like colors. Do not bleach. T umble dry low. Do not use fabric softeners. Do not iron. Do not dry clea n.
Not satisfied with the brand. Not made well. It's a nice jacket but after just a few times wearing it, the stitching around the wrists started to fray!! I thought this brand was made to last for outdoor work and all I did was wear it for casual wear. Such a great investment, Best purchase I've ever made! I got this coat two years ago and every fall/winter I've warn it almost every single day. No matter the weather; rain, snow, sleet, wind, you name it and it withstands it. It has held up so well and I am so grateful I purchased it. Very comfortable and warm jacket. I have a horse farm. I ordered this jacket in black. I love the jacket. The only problem I have is that it shows dust and bits of hay that stick to it. Love this coat! Long so it covers you when you bend over. Easy to move your shoulders and arms . Looks great! Love it. All the great Carhart features with stretch and moveability. Perfect! Wonderful Full Swing Cryder Jacket! I love my new jacket. It is warm and incredibly comfortable and enables me to move easily! Good Quality, offers great flexibility. I like this Jacket very much and would recommend it. It was a bit thinner then I anticipated, but just as well I can put a fleece under it in low temps. I feel it is a little larger then true to size. I really like the flex panel in the back, the extra length to cover my bum, and the hood. My husband kept telling me I needed a “barn coat” and after trying to climb between barbed wire with a fur collared hood on, I conceded. I have to say, I LOVE this coat. It’s equal parts cute and functional. Warm in 40 plus degree weather - haven’t been challenged yet with cooler temps. Very comfortable and easy to move it. You’ve impressed a city girl, Carhartt. Jacket is great! However it was not what I was looking for. I got it in the olive color, which was perfect. However, the fit was a bit frumpy. It gave me plenty of room to move and work, but maybe a little too much. The snaps on the side helped pull it in a tad, but not enough for my liking. Overall, it was a great coat! Super warm and excellent quality (as usual for Carhartt), you just may want to consider one size smaller if you’re wanting it to fit a little better. I purchased this jacket back in November 2018. This is the best jacket I ever purchased. I normally wear a Women's large but the medium fits me perfectly. I used this jacket to shovel snow, working and walking outside in the sub zero temperatures and I was never cold. I did wear a light sweatshirt underneath the jacket in the subzero temps as extra protection from the -20 degree temperatures. In addition, the hood was perfect for keeping the inclement weather off my face. I love this jacket and this has been my "go-to" jacket all winter! Note: This was my first Carhartt purchase and I normally do not provide a review but I am very happy with the product. I really like this coat, however I'm not crazy about the sleeve ends. I guess they are supposed to be a little shorter for working, but for every day wear I find them a little short. I’m a cattle rancher and like this coat as it is warm but also has enough room for layering. Seems pretty tough, time will tell. Ordered medium, I’m 5’8” 130lbs. I work full time outside and I’m pleased with this coat. I needed a jacket for outdoor work in the fall/spring that wasn't my nice puffy jacket and this is perfect. It's a lighter material than a normal carhartt jacket, which allows me to move better when doing woodworking projects and the exterior still seems very durable. I wouldn't wear it in the Northeast in the winter unless I'm moving around a lot or if it's really sunny because for me, it just wouldn't be warm enough for below freezing weather. That being said I don't do a lot outdoors in the winter anyway. Fits very well, is not annoyingly girly (with random straps and features you don't need/that get in the way) and is a great overall jacket! Great jacket. Fits a little large to size. Good in cold weather, below freezing. I like the jacket. a lot. Fits well, understated yet sharp looking, and very functional. I got this jacket for Christmas and couldn't be any happier. I am able to still wear a sweatshirt under if needed and if not, it doesn't look to big like most usually do on me. Moves well with whatever type of work you are doing. The jacket is very comfortable. Fits true to size and isn’t bulky. This jacket is perfect for work! This jacket keeps me so warm and dry. I work on a horse ranch and it is very comfortable and I can move around well in it when feeding or grooming/tacking. I thought it may be too short but it’s the perfect length. I can wear it when I’m riding and my lower back doesn’t get exposed. I love the inner pockets and the fact that the outer ones have a zipper and flap. Other jackets I wear that are openend up with so my hay in the pockets when I feed but not this one. And the hood actually covers my whole head, it’s always annoying when when your forehead still sticks out and your face gets rained on. This jacket is so durable and well designed, I would definitely recommend it! It's lightweight enough to wear all the time and not only for working. Extremely comfortable and looks great. I'm very disappointed, my last coat was discontinued and this is Carhartt's new one to replaced it. I followed the size guide and ordered the same size. The sleeve cuffs, which I loved in the original, are at least an inch and a half shorter on this one! Which makes this coat useless to me and I will be returning it. Going up a size would make the rest of the coat huge. If you're looking for a good durable winter jacket this is it! I love that the cuffs of the sleeves are long enough on one side to cover the back of your hand! Small details like that really make a big difference! Great jacket, and I would absolutely buy another! This jacket is awesome. Bought it for my wife, she loves it, she has received many compliments on how cute it is! I would definitely recommend this jacket for any ladies looking for a comfortable relaxing jacket that looks great. We love this jacket! We have 6 girls. 2 of the 6 now have this jacket. I am expecting the other 4 to want one as well. I already want one myself! I looks awesome and it is so warm!!! I would definitely recommend this item! absolutely love this!! got this jacket for work as a mail carrier in the northeast, and it keeps me wonderfully warm. very comfortable to move around in all day and it really keeps the cold out. it has a bunch of pockets and the green is gorgeous. Excellent! Bought for staff at an outdoor facility, everyone loves them! This is perfect for messing around with my horses--anything from chores to groundwork to riding. The wide range of motion is really helpful and it's warm. I wouldn't wear it in real rain out here in the PNW but it's great for showers. Lightweight, warm, and it looks good. It seems to be well made and sturdy so I expect it to last for years. Glad I bought it. This jacket is impressively warm without being bulky! This is my first Carhartt and will not be my last. The sleeves fit just right on me but I will say that usually sleeves run long on me. So I can understand why other reviewers find them short. I am also a large in most tops, but I found the large in this coat a little too snug. I really love this jacket but there are a few things that would make it perfect. The inside sleeve cuffs are too long and it makes it hard to wear things underneath such as a watch or second layer. Also the front pockets need lining- the thin layer of canvas doesn’t keep my hands warm at all. Finally, most winter jackets have a softer lining of some sort around the face. This jacket is ok but a little rough when you zip it all the way up. Overall though I would definitely recommend. We appreciate your feedback. Please feel free to contact us at 1 800 833 3118 with any questions. I am so glad I tried on a carhartt jacket at a boot barn before purchasing this online. I usually wear a size medium or large and wanted a jacket I could layer with a flannel or sweater underneath. I ended up ordering a size small and it fits perfect for layering or wearing alone. Keep in mind the sizing chart on the website measure is off, in my opinion. I would have ordered a size medium if I followed the chart and would have ended up switching it out. I would highly recommend this coat. Love this jacket, it's warm yet light weight and the material is super soft! I got this because I needed an every day jacket. I wanted one a bit longer than traditional 'winter' jackets you find at your sporting goods stores but not long like the other extreme. This is casual yet functional. Like the jacket a lot but the sleeves run short. I have never had a problem with sleeves being too short and with this jacket the sleeves are almost too short. Beautiful coat for casual wear and perfect for working coat. Especially love the extra room around the shoulders and arms. Love this coat! Great jacket with comfort and duribility. Need another one. Very comfort & moves well perfect for working outdoors! We're sorry to hear of this experience. Please contact us at 1 800 833 3118 with any questions or concerns. This jacket is not available without a hood. It does not say it has a hood in the description and I received it with a hood. Surprised to say I was not prepared for a hood. Carhartt should make the hood optional. The Carhartt brand is the absolute Best! I love all the clothing and wallets, money clips and more The women’s socks are the best too. Carhartt loving woman. This is my first Carhartt purchase I moved from Cali to the Midwest and needed a much warmer coat. Lets just say I am in Love with Carhartt's they really are well made and the warmest jacket I have ever owned now with that being said I have only 1 issue. I purchased Women's Full Swing Cryder Jacket in size Large it fit fine but decided to go up to the XL Women's Full Swing Cryder Jacket in olive The problem is the XL is roomie except in the back and arm department .The body section is very roomy but when I drive or reach for something the back and arm area pulls so tight even with it unzipped. The arm goes up to 3 to 4 inches above my wrist and I feel as if the seam on the underarm is going to split(So far the quality prevents that)Hope to purchase a new Carhartt Coat one day the brand is very well made Just this style isn't for me but ready to try new. We appreciate your input and are sorry to hear this jacket wasn't 100% what you hoped for. Please feel free to contact Customer Service at 1 800 833 3118 if we can further assist in any way. Absolutely love this coat. The fit is perfect, comfy, easy to move in, and cute!! Does this Hood fully detach? What size would be equivalent to a men’s large? BEST ANSWER: if you wear a Large in men's, you would probably want to go with an XL in our women's line. Please contact us at 1 800 833 3118 with any questions. BEST ANSWER: The center back length for a size 2XL will be 27 1/2 inches. Could I wear a thick hoodie underneath or should I size up? BEST ANSWER: You should be fine with your regular size, unless you want the coat to fit very loose. I got an XS and I can wear three layers (t-shirt, longsleeve shirt, and hoodie) underneath - and it's still comfortable with lots of room to move. The waist snaps at the back give it a nice shape even with lots of layers. However, the sleeves were a bit short so the hoodie (or shirts) underneath might stick out at the cuffs. I don't. Know how thick of a hoodie you are talking about, but I wore the jacket to the Artoc Circle and wore 2 or 3 layers of clothing under it. And was quite comfortable. Suggest see if their is a dealer close so you could try it out and then order from Carhartts. Hope this helps. You can wear a thick hoodie underneath. I have a medium and fit only a medium no smaller. I have room still, but snug enough where it is comfortable too. If it is a bulky sweater or hoodie, I would size up, as the sleeves might need extra room. Plenty of room under it to put a hoodie on. I am 5’4 and I weigh 190lbs I have pretty wide shoulders. I have a Large north face jacket and it fits good except for the fact that it is too tight for my shoulders. What size carhartt jacket would I need? Hello! I am similar in height and weight to your description and bought the Cryder jacket in an XL last year. It seemed to fit well, however I did return it because I liked the look and functioning of Full Swing Caldwell Sandstone Sherpa lined jacket better. XL maybe? I’m 5’4 weighing 170 lbs and I wear a large in this jacket, the medium felt too tight on my arms and armpits. Why are there not more MADE IN USA options regarding outerwear? It is nearly impossible to find heavy (warmest?) outerwear made in USA. BEST ANSWER: We'll be glad to pass your feedback along. Would I be able to embroider a company logo on the back of this? BEST ANSWER: Honestly, I wouldn't try to embroider something on it. It is a durable thick canvas and you don't want to compromise the integrity of the jacket. It will be quite some work by hand, and most likely too thick to do with a machine. My Company Has done exactly what you are talking about and it looks great on it. They used the Zipper opening so that they did not stitch the pocket shut. What is the temperature rating of this jacket? Is it good in -40°C weather? BEST ANSWER: We do not temperature rate our garments, but we do categorize them as warm, warmer or warmest. This style features Thinsulate insulation, which is in our Warmer category. Is this jacket flame resistant? I am looking for a coat like the mens full swing steel jacket, but mens will not fit me. Is this jacket made with the same fabric as the mens full swing steel jacket? BEST ANSWER: The Full Swing Cryder is going to have a similar outer shell to the Full Swing Steel jacket. The Shell will be an 8.5 ounce, 59% cotton / 39% polyester / 2% spandex. The lining will also have a 60g thinsulate insulation. 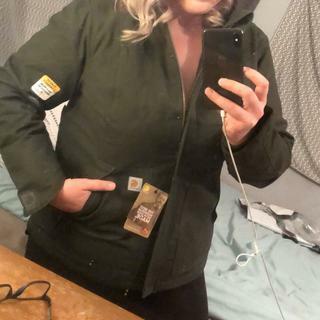 I have seen other pictures of the Olive colored Women's Cryder jacket on the internet, does it come with white stitching on the outside or not? BEST ANSWER: I have last year’s model of the olive Cryder Jacket and the stictching is the same color thread as the material, it is not white. I have this year’s model in black and the thread color is black on the outside. I hope this helps with your decision to purchase. These jackets are some of the best on the market. They are tough as nails, water repellent, warm, and they break in beautifully. It’s a workhorse! I bought my daughter the maroon one and I do not think it had white stitching because she would not have liked that. I have this years model in olive and the stitching is the same color thread as the material. I own the Olive color jacket from this year and there is no white stitching on the outside. No white stitching on the outside. The outside stitching is olive. What is the material content of the thinsulate insulation lining? BEST ANSWER: This features 80g of Thinsulate insulation. Thinsulate is actually a brand name and is a synthetic fiber thermal insulation. Is the deep wine more of a maroon or dark purple? BEST ANSWER: Hi Becky, In my opinion it is closer to maroon than purple. More of a maroon than a plum color. Have a 44 chest 45 waist and 43 hips around 6ft 2in 250 lbs what size is for me? BEST ANSWER: You would probably need a men's 2XL. Unfortunately, we do not make a women's size that will fit these dimensions at this time. We apologize for any inconvenience and will share your interest with Product Design. BEST ANSWER: Yes, they are a similar fit. We recommend the same size for both jackets. What is the sleeve length on a small vs med? BEST ANSWER: Small has 33 3/8 inch sleeves. Medium has 34 inch sleeves. How will this jacket hold up to welding and grinder sparks? I see that it is a cotton/poly blend and worried it will just melt. BEST ANSWER: The sleeve is angled to provide some protection to the top of your hand but still allow you to use your hand without the material getting in the way or rubbing up against things. What is the sleeve length for large? BEST ANSWER: As measured from the center of the upper back, it is about 34 3/4." Does this jacket have a double zipper ? Would allow for riding astride a horse for ranch work. If not please consider adding a double zip and/or side vents to make it more usable please. Thank you. BEST ANSWER: This style does not have a double zipper. Which jacket is considered warmer, this or the Crawford Sherpa Lined (#102748)? BEST ANSWER: We don't temperature-rate our gear, but the 102748 will likely feel just a bit warmer than the Cryder. How long is this jacket in the back for size Large? BEST ANSWER: The center back length on a large measures 26 11/16 inches from the center back collar to the bottom of the jacket. I am 5'3' and the jacket sits low on my hips. I love this jacket! Do you need more precise measurements? BEST ANSWER: We do not offer any garments at this time that are made with real down feathers. Will you ever do tall for woman's clothes? I love love your cold weather clothing but it tends to be short on me. I'm only 5'8"
BEST ANSWER: We feature taller-inseam pants, but no "tall" jackets or tops for women thus far. However, we have definitely shared your feedback with Product Design. BEST ANSWER: They are both good options, but the Sherpa-lined WJ141 may feel warmer. It has a heavier outer shell. Hi, my husband has the "Quick duck Jefferson traditional jacket" and he loves it, would this jacket be considered the closest one to that for a woman? Thank you so much! BEST ANSWER: This will be the closest to the material and lining that he has. This one is made of 8.5 ounce, 59% cotton/ 39% polyester/2% spandex with 80g of thinsulate and his is made of 8.5 ounce, , 60% cotton/40% polyester canvas with 80g thinsulate. I'm not familiar with the Quick Duck Jefferson jacket so I can't really make the comparison. However, I do love this Full Swing Cryder jacket. It is not too bulky, the fabric is tough and resists wind and rain, and has a metal zipper instead of plastic. I wore it outside this morning in 4 degree weather (with several layers underneath) and it kept me warm. I love this jacket! I bought this coat for my daughter in deep wine and she loves it!! BEST ANSWER: It is not waterproof, but it is water repellent. How long are the sleeves on the Women's XL? I am close to 6' tall and most jackets leave my wrists cold. BEST ANSWER: The sleeves on size XL measure 35 5/8 inches from the center back collar to the end of the sleeve. The sleeves are fairly long and have an extended part that covers the wrist and hand. It works great. What are the dimensions of the jacket in an extra small? I.e. Sleeve length. BEST ANSWER: The sleeves on the XS measure 32 3/4 inches from the center back collar to the end of the sleeve.